Geraniums, also referred to as "crane's bill," are both annual and perennial favorites in the United States and around the world. Known for their rich, showy blooms and hardy, easy-to-grow nature, geraniums thrive in the ground or as ornamental outdoor container plants. Geraniums are partial to the warm weather and make a beautiful addition in beds or borders. They're especially lovely as they cascade over ornamental containers. Geraniums are native to South Africa where there are over 400 varieties of this hardy bloomer. Though they are treated as annuals in cooler climates, they can come back each year as perennials in the warmer, southern states. Geraniums make a colorful adornment to any flower bed but they're especially popular as hanging or sitting container plants for decks and porches. 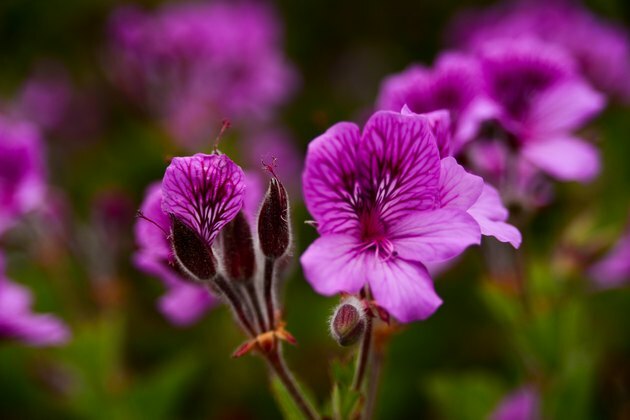 Though they're best known for their rich red, pink or white flowers, geraniums also grow in deep shades of blue and purple. In addition to their vibrant blooms, geraniums have a citronella-like smell that keeps away mosquitoes and other pests. Geraniums can grow up to 36 inches both high and wide if roots are allowed to spread. Plant geraniums in the spring after there's no danger of frost. 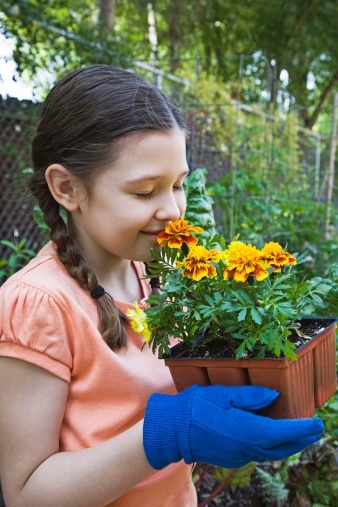 Choose an area that gets at least six to eight hours of direct sunlight each day with well draining soil. Plant each geranium 12 inches apart to keep roots from spreading too far. Add compost around the plant and backfill with soil. Cover the planting bed with mulch to protect the roots and prevent weeds. Geraniums also thrive as container plants and enjoy being slightly root bound. Choose a pot with plenty of drainage and use a good quality, well-draining potting soil. A container that is no more than inch larger around but the same depth as the plant is perfect as potted geraniums do best when their roots don't spread. Add a little compost to the bottom of the pot to feed the roots before placing the plant inside and top with soil if needed. After planting the geranium, water thoroughly to establish the roots and place in a sunny location. Geraniums like full sun best but can also thrive in partial shade. Water as needed, but avoid overwatering as that can lead to root rot. Allow the soil to dry between waterings. Geraniums may need more frequent waterings during especially hot weather. Deadhead spent blooms to encourage blooming throughout the growing season.